Beautiful sparking multicolored cluster teardrops Moonstone dangle earrings. 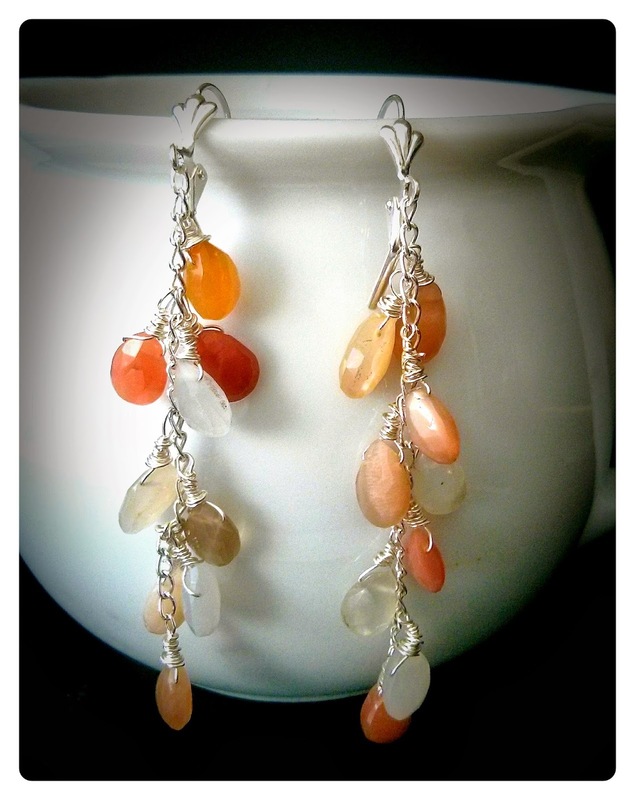 Each of the gemstones was wire wrapped by hand. There are nine faceted 8-9 mm teardrop moonstones colored from peach to snow white. The earrings are 3'' long from top to bottom. Priced as low as $28 + shipping and handling. As ancient as the moon itself, Moonstone holds the power of mystery. Its secrets are locked beneath a pearly veil, and with them, our own hidden truths. Moonstone is a simply gorgeous gemstone that virtually glows in soft white, beautiful peach, elegant grays. Moonstone lore suggests the gem is an emotional balancer that helps to minimize the tendency to over-react and provides one with the ability to compromise, as well as relieving stress and promoting serenity. In general, the energy of moonstone is balancing, introspective and reflective. It is a stone for wishing and hoping as well as a stone for embracing the cycles of change. Moonstone is a stone for feeling and understanding via intuition and emotional thoughts rather than intellectual reasoning. It brings flashes of insight, and stimulates intuitive recognition and helps in applying intuitive knowledge in a practical sense. Moonstone has been used in jewelry for centuries, including ancient civilizations. The Romans admired moonstone, as they believed it was born from solidified rays of the moon. It has always been a sacred stone in India with a special significance for lovers, and is a traditional wedding gift there. Both the Romans and Greeks associated Moonstone with their lunar gods and goddesses. In more recent history, the moonstone became popular during the Art Nouveau period. In many cultures, moonstone is strongly associated with love. Many cultures have believed the moonstone to be a calming, healing stone. 1. Never put your Prehnite in hydrochloric acid - as it will be dissolved. 2. Do not clean it with alkali. 3. Do not heat your Prehnite - even small heat, such as one from a candle, can damage it and the surface may become bubbly. 4. To clean and wash it use ph-neutral soap solution, lukewarm water and soft cloth. That's it! 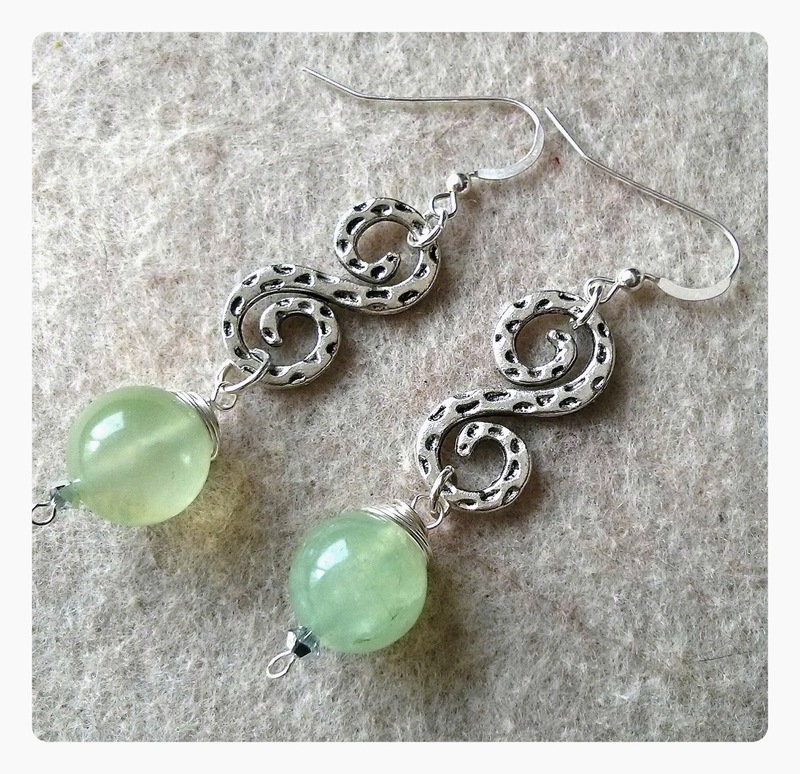 May your precious Prehnite pieces of jewelry have a long a happy life! Prehnite is soon becoming one of my favourite stones. 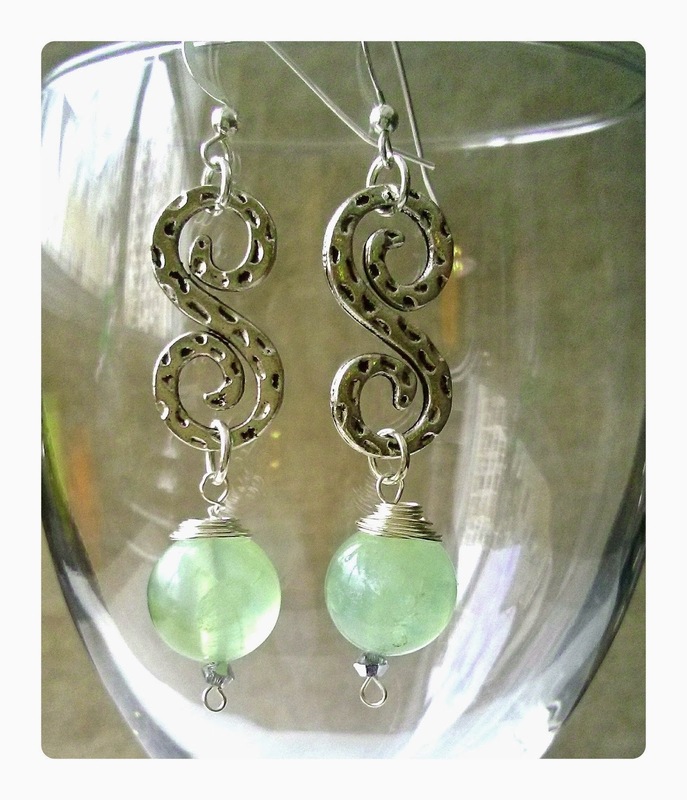 It has a rare green semi-translucent color which goes so well with silver. And it does so remind me of green grapes! Some of the other names for Prehnite - Cape Emerald (as it was first discovered in Cape of Good Hope in South Africa) and Grape Jade. A member of the Garnet family, Prehnite is commonly a light green to yellow color, and often has narrow black or white inclusions. Its hardness is 6-6.5 on Mohs scale. After being tumbled and polished it glows with pleasant nice shine. Prehnite is a stone of meditation and dreaming, of calmness and peace. It quiets restlessness, nervousness and worry. 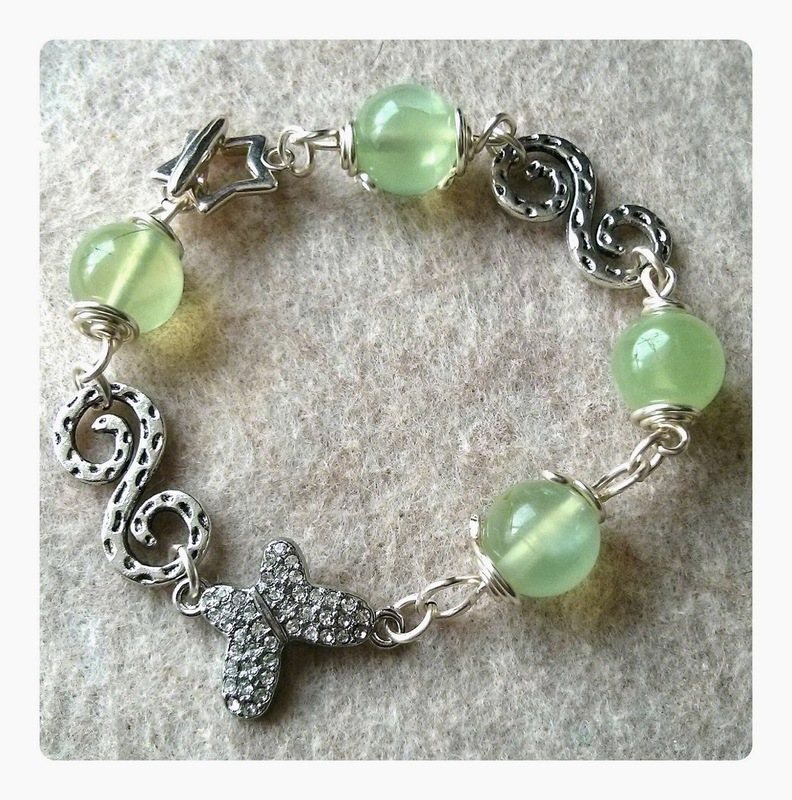 My very first Prehnite bracelet I made was a custom made order. 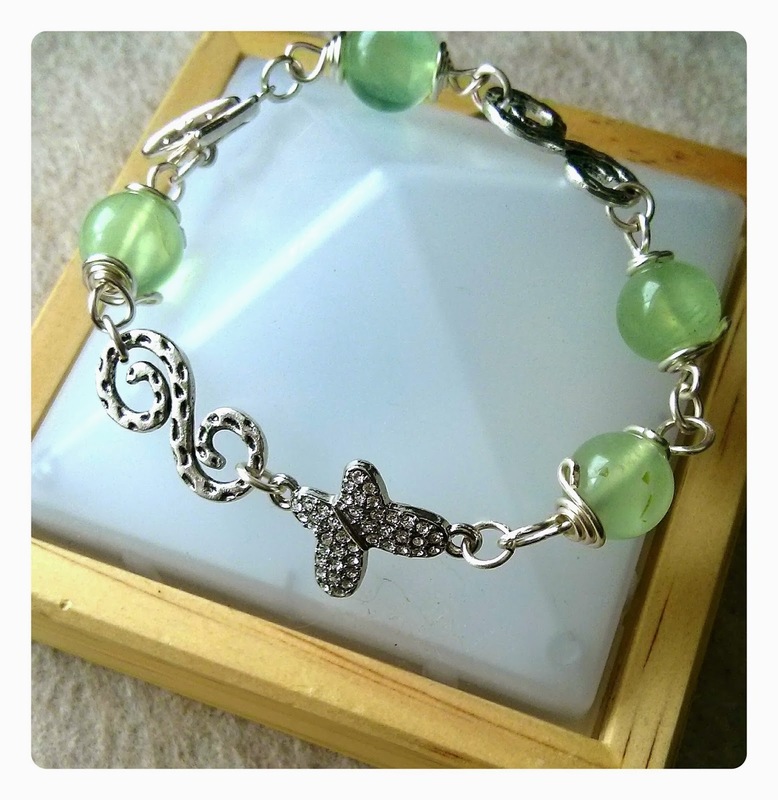 For those of you who missed it, there is the link to it: Sterling Silver Prehnite Bracelet. 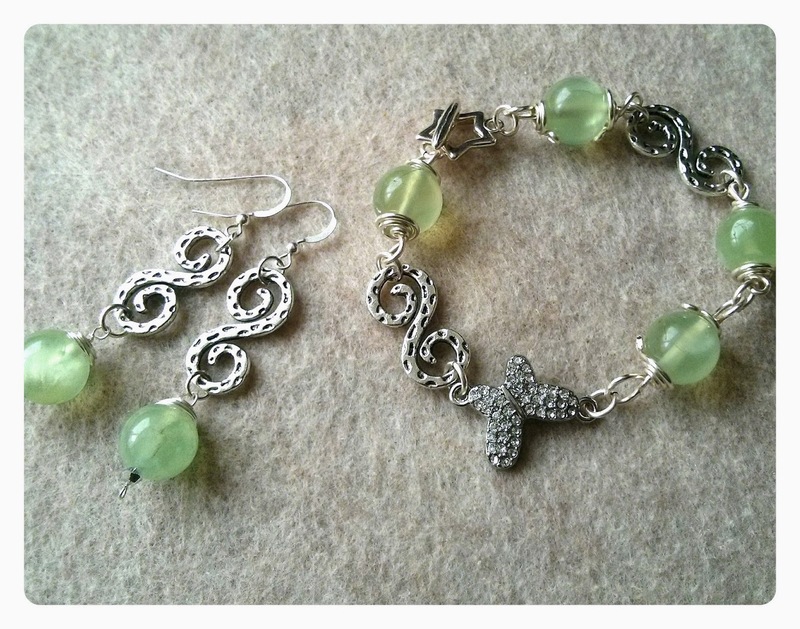 This Butterfly Swirl set is made of 10mm high quality Prehnite beads, crystal Butterfly connector, star-shaped toggle, pewter silver lead-free links and findings. The bracelet size is 8'' long. The earrings are 2'' long from top to bottom. If you want to buy the whole set - earrings and bracelet, it will only cost you $42 (you save $11) + shipping and handling. The bracelet alone is $38, and the earrings alone $15 + shipping and handling.